When 12-year-old Colton Wescott finds himself alone with a sick Ma and two younger sisters to take care of, he knows he's got to take matters into his own hands. The family was headed towards Sacramento with a wagon train, but then his father bolted and Colton can't count on any help from the other travelers. You see, Colton's Pa is white and his Ma is a free black woman. So they're relegated to the back of the wagon train, their water becomes mysteriously salty in the night, and none of the other travelers are willing to share food or advice with them. Colton manages to get his Ma to a doctor, but he knows he'll need money, so when he sees an ad looking for Pony Express riders, he hurries to apply. It won't be easy. The route they have for him is extremely treacherous, going over the Sierra Nevada mountains. And Colton knows that he needs to "pass" for white or risk being hanged. When Colton's Ma gives him important freedom papers to deliver to her sister in Sacramento, Colton's fate is sealed. He must get those papers to California or die trying. And with a country on the brink of war, every second counts. I loved this wild west adventure story. Set in 1860, just before the Civil War, there's a lot going on. The Pony Express riders are entrusted with bringing news of the presidential elections and the developing war to the prosperous state of California. 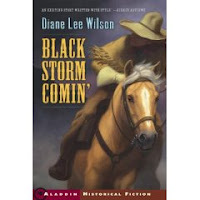 Wilson explores issues of race in the character of Colton and in the characters he meets along the way. Colton's got "one foot in each world" - he's both white and black. Along the way, he meets people who treat him differently based on how they see him, and how he sees them. Though the beginning seems a little depressing (what with all the abandonment and mistreatment of Colton's family and all), things level off shortly thereafter. There is some violence (Colton gets shot, he meets a slave chaser who cuts the ears off people who look at him wrong, he helps a man with a graphically-depicted broken leg), which might make it more appropriate for middle school readers. Also, some background knowledge of the Civil War and/or slavery in the 1860s would probably be beneficial to grasping the urgency of the plot. Wilson includes an author's note that tells how she got the idea for the story and how she researched it to make sure the details and characters were accurate (yay!). I didn't know anything about the Pony Express, but this book made me feel like I was out west, seeing all the action for myself. At the end of the book, I didn't want to leave the characters. I wanted to know more about what happened to them. Not everything is wrapped up... and I think that's okay. The important stuff is. It's a book I never would have picked up on my own, which is one of the reasons state book awards are so great! Thats exacty correct. I'm only 11 and i say the book is a good (and i read it). same I like this book, the review was not very detailed.